Posted in: BSU Journal Club. Tagged: exoplanet, exoplanet transit, Kepler mission. The tightly packed system, named Kepler-444, is home to five small planets in very compact orbits. 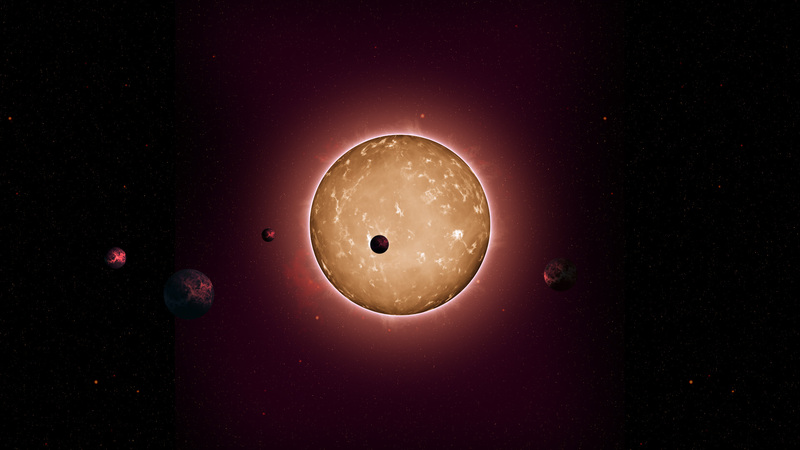 The planets were detected from the dimming that occurs when they transit the disc of their parent star, as shown in this artist’s conception. 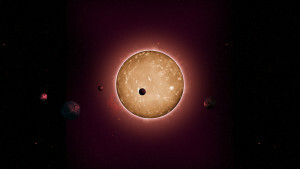 From http://www.nasa.gov/ames/kepler/astronomers-discover-ancient-system-with-five-small-planets/. In journal club on Friday, we discussed a fascinating paper from Campante and colleagues announcing discovery of one of the oldest planetary systems ever discovered — Kepler-444. The system comprises five planets, ranging from roughly Mercury- to Venus-sized with orbital periods from about 3 to 9 days. Studying the frequencies of oscillations within the K-dwarf host star (an approach known as asteroseismology), Campante et al. estimate the host star, and therefore probably the planets, is about 11 billion years old, almost as old as the Milky Way galaxy itself. To put that age into perspective, by the time our solar system formed, about 5 billion years ago, the Kepler-444 was already a billion years older than our solar system is now. The existence of such an old system tells us that rocky planets began forming almost as soon as the Milky Way itself formed, which allows for the exciting possibility of very ancient life in the galaxy. Present at journal club were Jennifer Briggs, Trent Garrett, Nathan Grisgby, Emily Jensen, Liz Kandziolka, Brenton Peck, and Jacob Sabin.